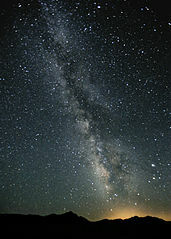 is that it shows a stark contrast between the changing nature of our world—with its city lights, passing clouds, airplanes scurrying to and fro, and satellites high above—and the glory of God seen in His creation of the Milky Way, which DOES NOT CHANGE because HE DOES NOT CHANGE. "Jesus Christ is the same yesterday and today and forever" (Hebrews 13:8)! We can count on Him, for His power and glory are eternal.